This week I have had the pleasure of attending the London Film Festival, and the 3rd film I had the joy of seeing was Kenneth Lonegran's excellent Manchester By The Sea. It follows a hardened handyman (Casey Affleck) who returns to his hometown after his brother (Kyle Chandler) dies, to care for his 16-year-old nephew (Lucas Hedges), but his arrival unearths a checkered history. If you have been following my London Film Festival reviews, you might have noticed a theme in the films I have watched over the past few days at the prestigious event... They are all great. And they are all very, very sad. 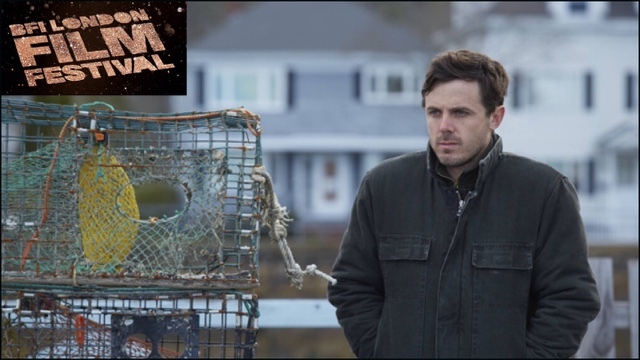 Manchester By The Sea floored me emotionally. Drained my eyeballs. Casey Affleck is definitely one of the reason's why. His performance is layered, beautiful and, yep, once again, another theme, his performance is raw. Lee Chandler, Affleck's character, feels like a real person, and I am sure that is thanks to Kenneth Lonegran's brilliant script, but Affleck also conveys that rawness, definitely a contender for the Best Actor Oscar in a few months. But Affleck isn't alone. Manchester By The Sea is full of layered, incredible performances, notably from Lucas Hedges and Michelle Williams, who I also think could be big award contenders come awards time. Hedges is fantastic as Patrick, Lee's nephew. He is surprisingly the film's biggest comic relief, even though his character is dealing with huge grief. He does have one scene where he breaks down, and that scene is his best. Williams delivers an incredible performance as Randi, Lee's estranged ex wife. I wont spoil anything, but they are estranged for a very sad reason, and once they have their big reunion, Williams delivers the best piece of acting in the whole film. Manchester By The Sea is completely character driven. And that is quite rare nowadays, but it was definitely refreshing to see. Lonegran's script is brilliant. In a subtle, yet ambitious way, he directs his actors obviously well, and even though Manchester By The Sea might run a little long, Lonegran's script, and his characters kept me engrossed in this incredible film for at least 2 hours of it's 135 minute run time.